Wer zuerst kommt, mahlt zuerst.. The Sachsenspiegel (lit. 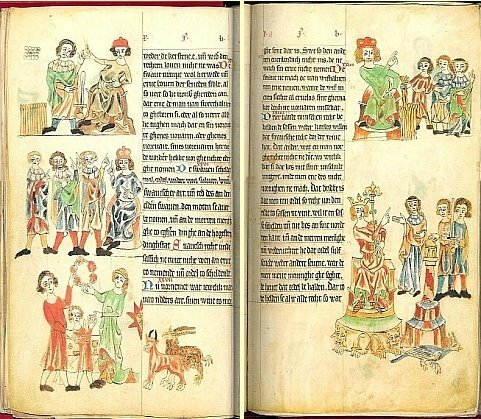 Saxon Mirror) is the original document of German jurisprudence in which the customary laws of Saxony, previously transmitted through an oral tradition, were given permanence and stability in written form. 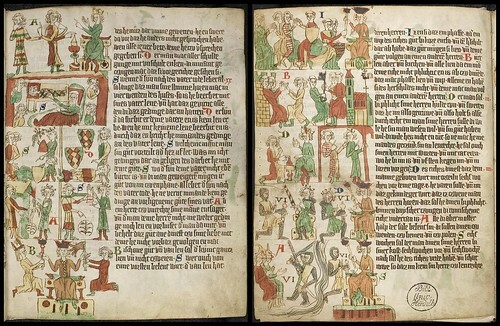 It was composed in latin between 1225 and 1235 by Eike von Repgow at the direction of Count Hoyer of Falkenstein and was very soon after translated into Low German. That gives it the distinction of being the first prose work written in the German vernacular language. 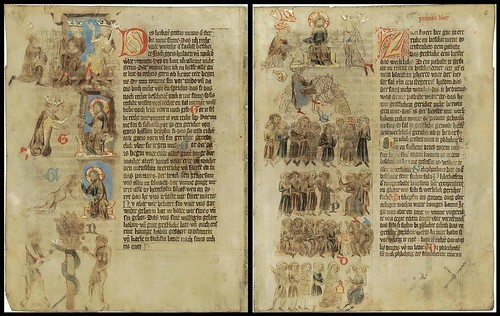 Beyond religious canon and Roman law, the Sachsenspiegel was without doubt the most important legal text for all of late Medieval Central Europe. 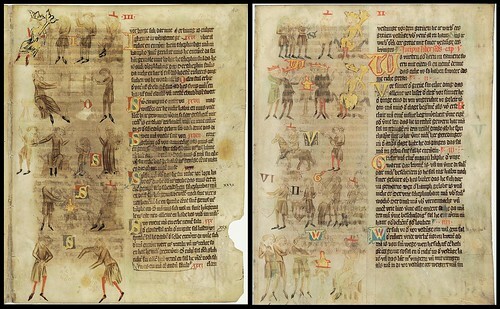 Within forty years of its first appearance, variants had been produced for the rest of the German speaking territories and its influence resonated in legal systems in Holland, Denmark, Russia and the Baltic States. It remained the legal authority for over three hundred years and its precedents were cited as late as 1932 by the German Supreme Court. The book contains information on a wide variety of legal topics, including administrative, constitutional and penal law, laws concerning inheritance, dowries, and marriage, property law, and laws governing the keeping, herding and hunting of animals. "Far from being strictly a set of legal rules, the Sachsenspiegel was built upon the interrelatedness of language, religion, literature, morality, and aesthetics; for this reason it re-created then as it does now the very structure of society. 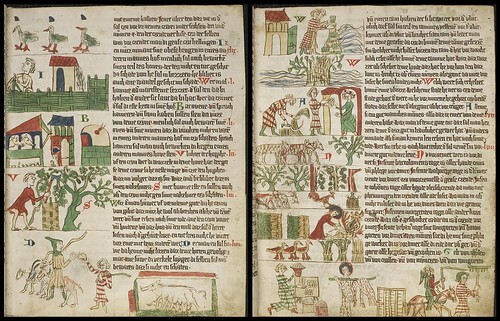 Consequently, this lawbook is unique because it opens a window onto medieval communities and the concerns of all their inhabitants, including serfs, free peasants, women, children, and ethnic minorities." 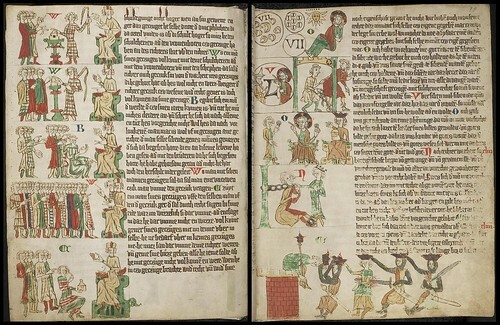 "At the right of each register of illustrations on these folios and throughout all the books sits a judge, often wielding a judicial sword, the symbol of his authority. The effect of the powerful seated figure before whom others must plead and be judged is one of lending the text authority; his sword and scepter point to it as if to say, "hear me, then read this." 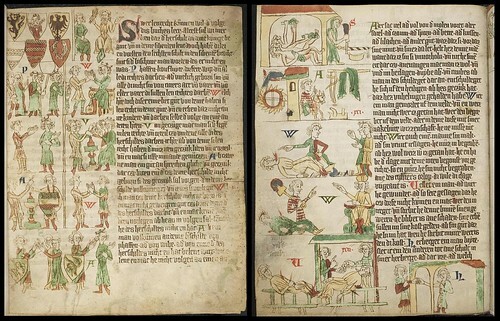 In the context of what may well have been a certain mistrust of texts in the late Middle Ages, these images could take on the function of reassuring users about the reliability of the book. While Eike's discursive, exception-ridden writing style is anything but reader-friendly, the scribes have made the book user-friendly. 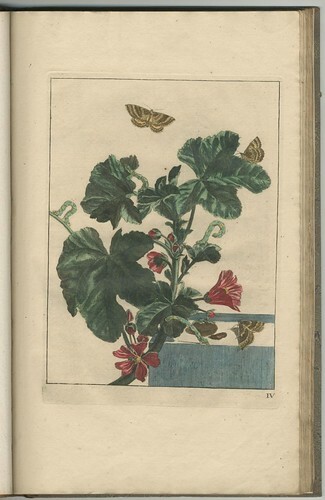 Throughout the entire text there are elaborate initials which are repeated in the image registers so that a user can quickly and without guessing associate the illustration with the corresponding specific language." 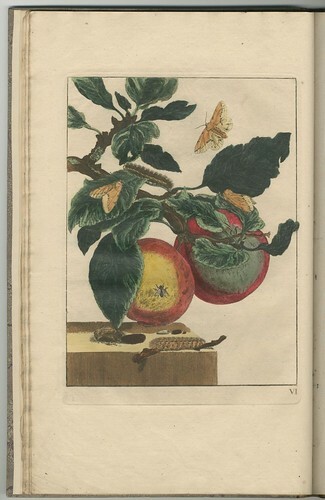 The 'mirror' in the title of the Sachsenspiegel functions as a metaphor in the sense that the text was intended to reflect regular daily activities under the ideal conditions of justice, against which a reader/viewer could measure their own life in order to remedy flaws. 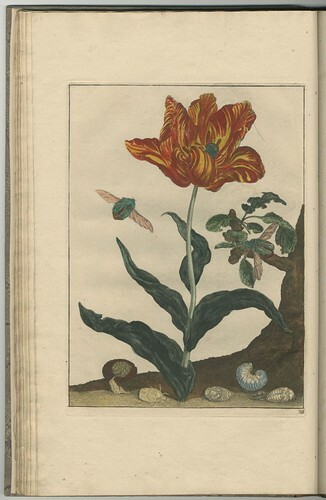 Or in Eike's words, in the Preface: "The book is called the Saxon mirror, since Saxon custom is given here in the same way that ladies observe their faces in a mirror." "An important cultural and historical significance is the additional information found within the pictures themselves. 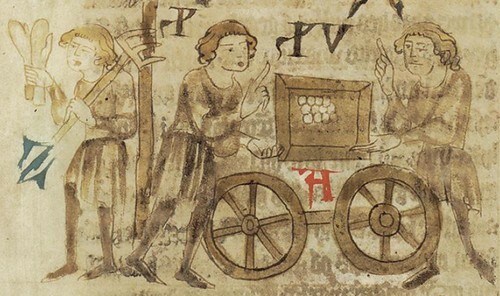 The drawings depict individuals of differing social groups, interior and exterior architecture, weaponry, landscape, household belongings, aliments (foods) and jewellery, all of which offer an invaluable source for further study and exploration of everyday life in the Middle-Ages." 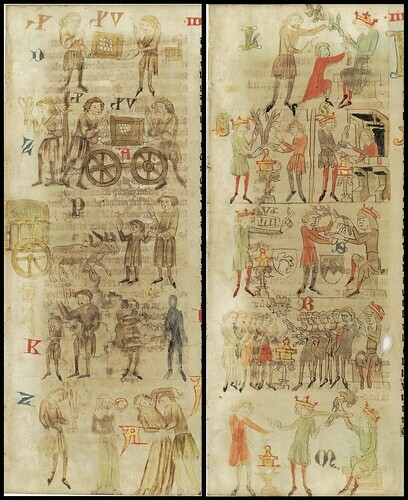 The Sachsenspiegel Lawbook at Tufts University, Massachusetts. 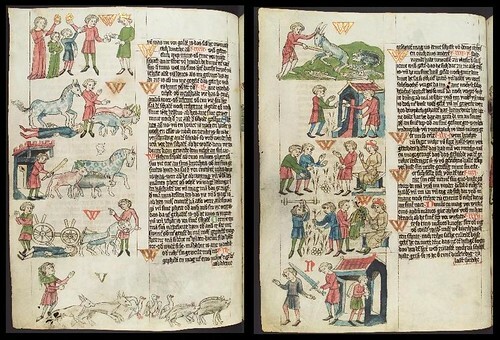 The Wolfenbüttel Mirror of Saxony -- Adeva fine art facsimile edition. 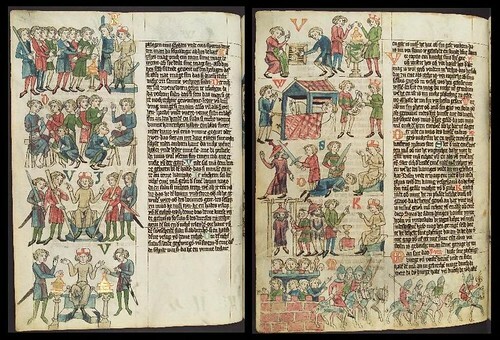 'The Illustrations of the Sachsenspiegel: A Medieval German Law Book', 2000, a short illustrated essay by GF Margadant (seems to be unavailable here or here). 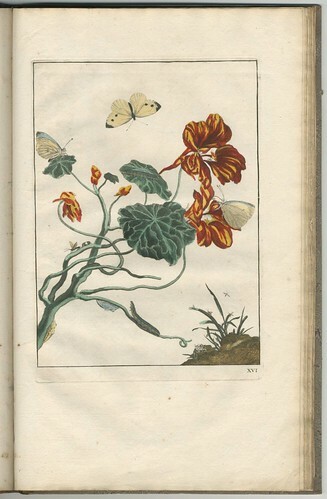 Sincere thanks goes to Mike Widener from the Rare Books blog out of Lillian Goldman Law Library at Yale University Law School for the suggestion, encouragement and assistance in relation to this post. UPDATE 2012: The Oldenburg Sachsenpiegel is now online. 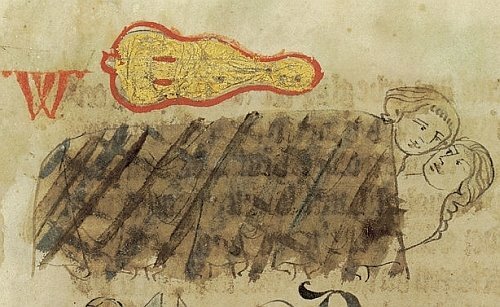 This detail from a Dresden Sachsenspiegel manuscript page [at the top] shows a woman engaged in an affair with a dirty hippie musician (we know it's a musician - and not a knight or nobleman - because of the lute or guitar above the bed). 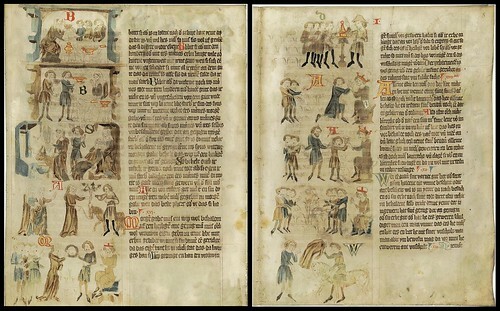 In this case, the illustration operates more in the way of a visual indexing icon rather than being additive to the adjacent text. The corresponding legal commentary notes that although the woman's bedhopping practices might be regarded as deplorable or dishonourable by society (the Sachsenspiegel is also said to be reflective of religious ideals), unless the sexual tryst is linked to an actual crime, then her legal rights of inheritance are not impaired. 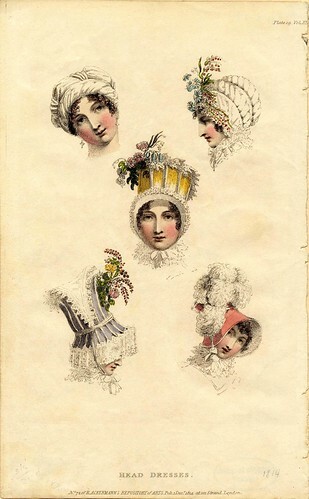 "Five women model head dresses for 1814. The woman in the top left hand corner wears a bonnet of white fabric. One piece of fabric is twisted and wrapped around her head creating a brim. The top of the bonnet poufs upward to cover her hair. She wears diamond-shaped earrings. The woman in the top right hand corner wears a three-tiered white bonnet with blue flowers and red berries adorning the front. The woman in the center wears a yellow and white hat. The top of the hat is covered with white, pointed-edged lace and has pink, blue, and white flowers decorating the left side. The hat is a cylinder made of vertical yellow panels and white ribs. The brim is white and trimmed with lace ruffles. It ties in a bow underneath her chin with a white ribbon. The woman in the bottom left hand corner wears a tall, purple hat, the upper portion of which is cylindrical with a flat top. A small piece of white fabric, trimmed in white lace, is laid over the top of the hat. Pink and yellow flowers and red berries adorn the front. Vertical, white ribbing surrounds both the upper portion and the brim, which is bell-shaped. The brim is edged in white lace. 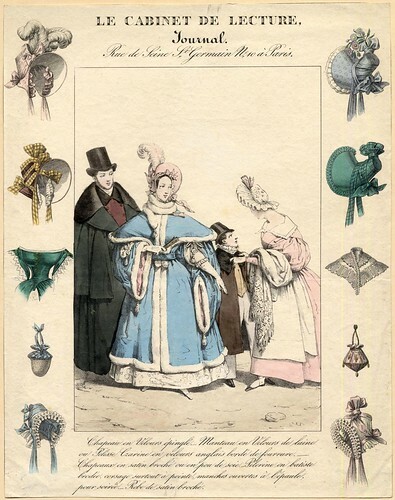 The woman in the bottom right hand corner wears a deep-brimmed pink hat adorned white feathers." "The central image shows a bearded man wearing a black top hat, a long, wide-sleeved black overcoat or cloak with a black fur collar, a double-breasted burgundy waistcoat with dark buttons and a black collar, and a white cravat. 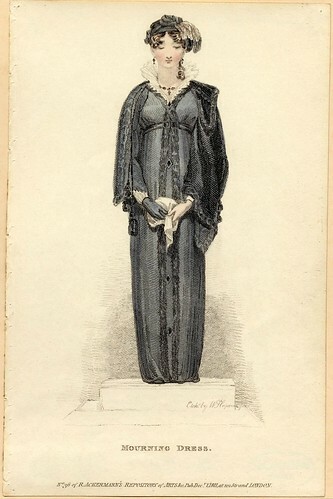 To the viewer's right is a woman in a white, short-sleeved evening dress covered by a pale blue opera coat. The coat has wide, pink-lined sleeves trimmed with white tassels and ornamentation. Its collar is wide and cape-like, with ends secured by a blue belt at the waist. The coat is edged with white fur, which matches the narrow, fur boa wrapped around the woman's neck. The woman wears white shoes and elbow-length gloves edged with white ruffles. She has a pink bonnet with an upturned brim; the hat ties under the chin and is adorned with pink bows and a single pink plume. The woman carries a closed, white fan. A small boy wears a black top hat, a knee-length cape with a black fur collar, pale, high-waisted trousers, a pointed, yellow waistcoat, black boots, and a shirt with a high, white collar. A nurse or maidservant helps him with his cape. She wears a pink dress with sleeves that puff above the elbow and are fitted at the wrist. Her dress has a wide white collar and a white apron tied at the waist. The woman wears white gloves and stockings and black shoes that lace up the ankle. A fringed, white shawl is over her left arm, and her white bonnet has a ruffled brim and a pink bow. It appears that the family is readying itself for a night out. Assorted women's fashion items border this central image. The left column starts with a pale pink poke bonnet trimmed with pink ruffles and bows and white plumes. 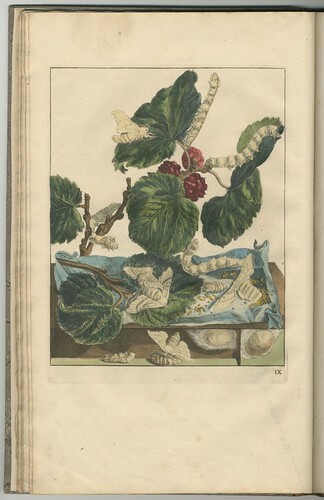 Below it is a maroon bonnet with an upturned brim. The brim is lined in white with white, lace-edged ruffles, and the bonnet is trimmed with checked, yellow ribbon. The next image is the tight, deep green bodice of an off-the-shoulder dress. The neck is edged with white lace, and the bodice has a line of green ornaments running down the front. The dress has split green skirts over a white underskirt and large, puffed white sleeves. Below the bodice is a small white purse or handbag, trimmed in blue with a blue ribbon handle. The final image on the left is a white bonnet trimmed with rows of blue ribbon and bows and with a lace-edged brim. The column to the right begins with an image of a pale blue poke bonnet with blue ribbons, bows, and flowers at the crown and white ruffles edging the brim. 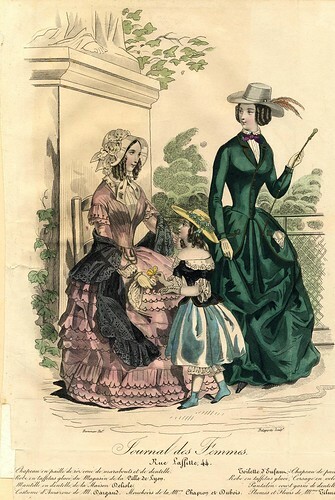 It is followed by a green poke bonnet with a ruffle-edged brim and green, checked ribbons and bows. 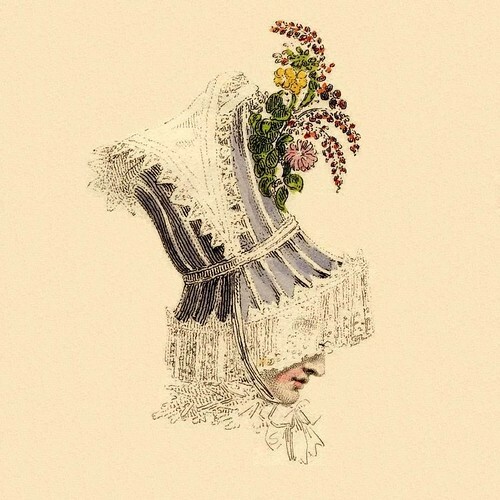 Below the green bonnet is a lacy white fichu or collar. Next is a pale pink handbag decorated with dangling gold beads and a gold handle. The final image is a ruffled, white bonnet decorated with pink ribbons and bows." 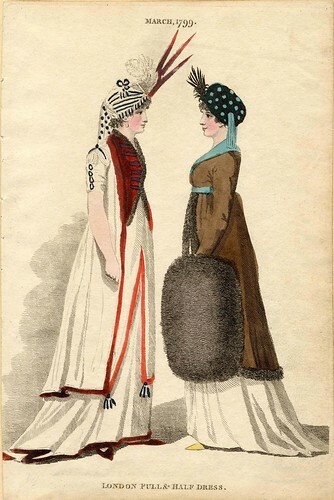 "Two women wear fashions for March 1799. The woman on the left wears a large white and black striped hat with a black bow on top, red and white feathers at the front, and a small white veil with black polka dots at the back. She wears a white, three-quarter length jacket with elbow length sleeves that has a military-style front in deep red with horizontal blue bands at the front and a narrow brown fur trim. The sleeves have gathered white fabric on the shoulder with black detailing and buttons. The dress underneath is white and has two layers. The top layer is tunic-like and three-quarter length. It is cut about half-way down the front so that it opens in an upside-down "V" shape. The edges are trimmed in red with blue tassels. The bottom layer is white with narrow red trim along the hem. The dress has a small train. She wears pointed red shoes. The woman on the right wears a black hat with light blue polka dots. There are feathers in front and a short light blue veil hangs from the back. She wears a brown coat with a blue collar, brown fur trim, and an empire-waisted blue belt. She holds an enormous dark brown fur muff in her hand. She wears a white dress underneath and a pair of yellow pointed shoes." 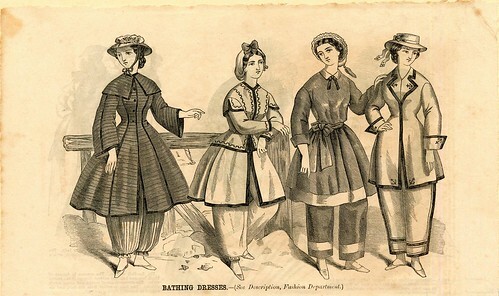 "Four women stand against a railing on the beach, all in bathing dresses. The woman on the far left wears a hat with flowers and a ribbon tied beneath her chin. Her dress has a wide collar and long bell sleeves. There are buttons down the bodice, ending at the waist, and is open below the waist. The dress ends at her knees and is black, edged with narrow black trim. 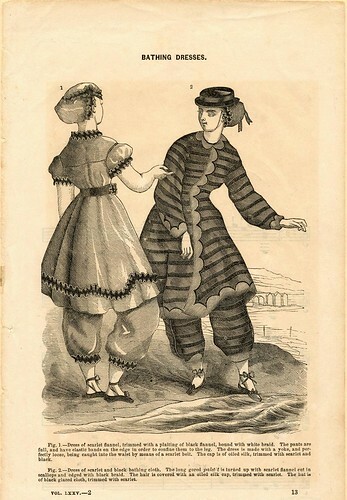 Underneath, she wears pinstriped bloused trousers that gather at the ankle. She wears flat slippers. The woman to her right wears a scarf wrapped around her hair, with a bow on top. Her dress has a high v-neck, long sleeves, and ends at her knees. The dress is light colored and edged in black. There is also a crenelation pattern around the edges of her bodice and upper cap sleeves. Under her dress, she has white pants that cinch in at the ankle, and flat slippers. The woman to her right wears a hat with a tassel in the back. Her dress is gray with a narrow white collar and three-quarter length cuffed sleeves. She has sash tied in a bow at her waist. Her trousers are gray, with a straight hem, not gathered. Both the dress and trousers have a wide white stripe at the hems. She wears flat slippers. The woman on the far right wears a sailor hat with a ribbon with little anchors at the ends of the ribbon. Her dress is white with a v-neck, lapels, long cuffed sleeves and ends just below her hips. Her dress, lapels, and sleeve cuffs are edged in black. On her lapels, the sleeve cuffs, and in the center front corners of her dress are small anchors. Her pants are white with black stripes down the sides and two stripes at the hem. She wears flat slippers." "Two women are depicted on the beach wearing bathing dresses. The woman on the left faces away from the audience. She wears a light gray bonnet with black ruffle around the edges. Her dress is a matching gray and ends just above the knee. She has black ruffles around the collar, sleeves, and hem of the skirt. She has a jewel neck, short sleeves and a black belt around her waist. Under her dress, she wears matching pants that end just above the ankle. They are gathered at the bottom and end with black ruffles. Her shoes are black slippers with laces that tie around her ankles. The woman on the right wears a hat with ribbons over a dark gray bonnet with black ruffles. Her dress has horizontal stripes in alternating black and dark gray. She has a jewel neckline, long narrow sleeves, and her dress ends just above the knee. Around the edges of the dress, and down the center front is a scalloped pattern in a lighter gray. Underneath her dress she wears matching pants. Her shoes are black and have laces tying around her ankles. The woman on the right dips her toe into the water, and in the distance behind the women is a row of bathing huts or tents." "There are three bathing dresses in black and white with no models. The outfit on top is horizontal. It consists of a dark gray short dress with a sailor collar, short sleeves, and a belt, as well as matching knee length cropped pants. 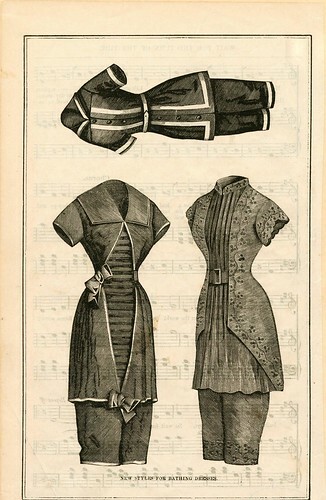 White bands decorate at the sleeves, the center front on each side of the buttons, and the hem of the dress, and the hem of the pants as well. The outfit on the bottom left consists of a gray dress with wide lapels, short sleeves, and matching cropped pants. The dress is edged with a narrow white stripe, with bows at the side of the waist and the hem of the dress. A horizontal stripe is visible under the dress down the center front, as if the upper dress is drawn back by the bow at the waist. The outfit on the bottom right consists of a gray dress with a narrow standing collar, short sleeves, a belt, and matching cropped pants. The center front has small pleats down the bodice, and the front, hems, and sleeves have a twining vine floral pattern along the edges." "The woman on the left wears a white dress with a chin-high collar and long, lace-trimmed skirts. Over the dress she wears a long-sleeved pink outer-robe that comes to just above the knees. It has a scoop neck trimmed in white with lacing down the front and white trim along the hem. The woman wears white stockings, flat, pink shoes, and short, buff gloves. 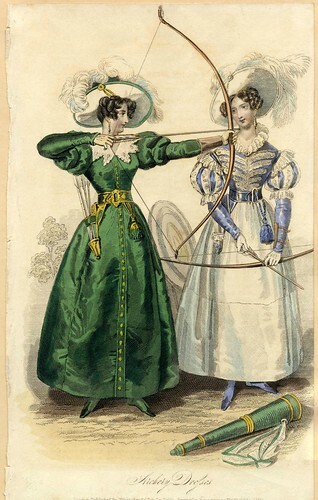 Her hat is straw with an upturned brim and chin bow. It is worn over a white bonnet or mobcap that is trimmed with ruffles and a spray of blue flowers. The woman's right hand rests on a closed book; her left leans on her companion's leg. The woman on the right wears a white dress with long skirts, a split, chin-high collar, and long, pointed sleeves reaching below the wrists. She wears a short, lacy, white cape, white stockings, and flat, peach shoes. Her gloves are short and buff-colored, and she wears a white, turban-like hat with a white, lace ruffle hanging to the left. This woman has her hands on the other woman's shoulders and seems to whisper in her ear. 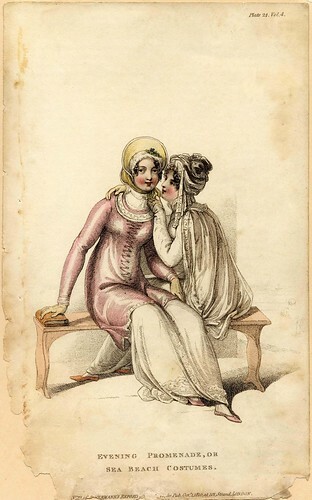 The two women sit together indoors on a wooden bench." 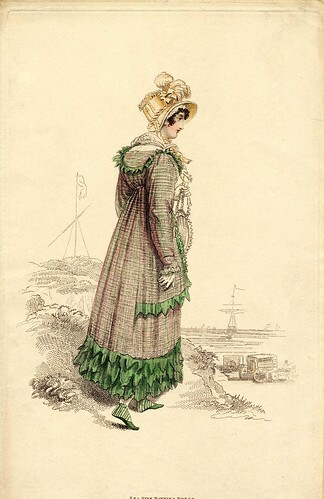 "A woman in seaside bathing dress for August 1815. She stands in profile on a cliff overlooking the ocean. She wears a cream-colored hat with a wide brim and feathers decorating the front. Her white collar is visible above the back of her dress and a small ruffle can be seen in the front. She wears a green and pink plaid dress edged with a green, pointed-edged ruffle. The dress is long sleeved with white, ruffled cuffs. Her shoes are green with white stripes. She wears white stockings and white gloves. In her left hand she holds a white handbag, trimmed with ruffles." 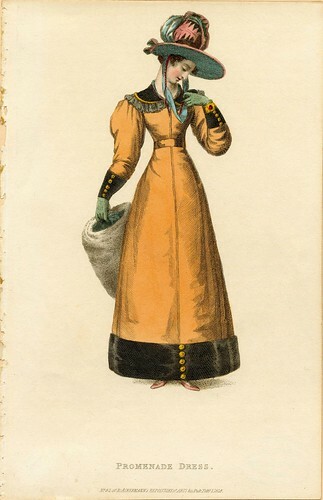 "A woman sits in marine costume for August 1826. She wears a white hat with lace and large yellow and pink flowers. A blue ribbon bow is attached to the underside of the brim on one side. Two long, light blue ribbons with white scalloped trim hang down from the back of the hat and are untied. She is adorned with pearl teardrop earrings and a pearl necklace. Her decollétage is covered with sheer, white netting under her gown. The collar of the gown is turned down and edged with narrow ruffles. She had scalloped, eyelet ruffles as epaulettes over the top of her leg-of-mutton sleeves. Her cuffs consist of a double row of scalloped, white, eyelet ruffles. Around her waist is a shiny, blue ribbon sash. The skirt of her dress is full length and plain to just below her knees where it is decorated with to a diagonal pattern of ruffles. She wears a pair of black shoes with white stockings and a pair of cream colored gloves. Around her forearm hangs a red, yellow and white handbag with three yellow tassels. 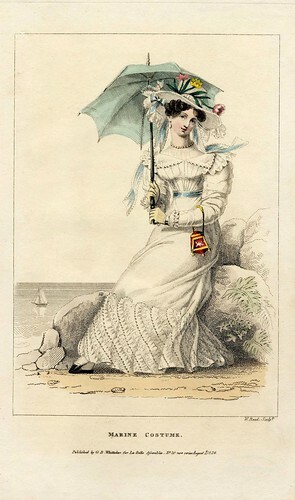 In her hands she holds a light blue parasol with a plain black handle. She is seated on a large boulder with boulders all around her. Ferns and other plants are growing on the rocks. Her feet are resting on the sandy beach which has smaller rocks and shells upon it. Behind her is the ocean with a sailboat in the distance." "Two women, one riding a horse. A woman stands in the back and wears a white lace dress, shawl, and picture hat edged with a lace ruffle and decorated with green bows and ribbon. 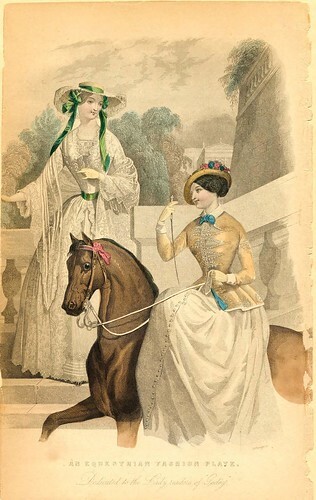 The woman on the horse wears a white dress with many small buttons down the center front, and a yellow riding jacket trimmed with appliqued lace at the hem and center front. The jacket has bright blue lining that shows at the turned back lapel, a narrow white collar and cuffs, and a blue bow tied at the neck. She wears a tan or straw bowler hat trimmed with flowers and carries a riding crop and a lace handkerchief. The horse wears a pink ribbon rosette on its halter near its ear." "Two women and a little girl are shown outdoors in a park. The woman on the left is seated in a wooden chair. Her bonnet is white with lace and ribbon details on the outside and white bow tied under her chin. Her dress is lavender with tiered layers of scallop-edged fabric on the shoulder and skirt. Underneath she wears a white blouse. Her accessories include a black lace shawl draped over her elbows, white gloves, and a white lace handkerchief. The little girl in the center wears a straw hat with blue flower decorations around the crown. She wears a short black bodice or jacket with white lace collar and cuffs, and a pale blue knee length dress.The white lace trim of her drawers is visible below her skirt hem. She wears black lace mitts and short blue boots with black toe caps. The woman on the right is dressed for riding. She wears a gray high crowned hat trimmed with two orange feathers. She wears a white blouse with a purple scarf or neckerchief tied in a small bow at the neck. He riding habit is deep forest green with the jacket lapels, hem, and cuffs edged in maroon. The jacket is buttoned down the front. The long skirts of the jacket has two pockets trimmed with frogs, and a white lace handkerchief hangs from the one on the left. In her gloved hand she holds a riding crop. Behind the ladies is a lattice fence and several trees. On the left side of the frame is the base of a marble statue, with only a bare foot and drapery visible, with ivy growing up the side." "A woman poses in a promenade dress from 1828. The woman wears a long-sleeved pale orange dress hemmed in black with black cuffs on leg-of-mutton sleeves. A column of gold buttons fastens the cuffs and accents the center front of the black band at the hem. She wears green gloves and red shoes. She also wears a thick gold bracelet, with a ruby in the center, around her left wrist. The waistline is defined by a band or ribbon the same color as her dress. The collar is made of black material and is edged with a small stripe of gold and then a wider band of ruffled dark lace. The collar extends to the shoulder. She wears a large bonnet with a flat blue brim and ribbon, and a large magenta pouf on top, with zigzag designs on it. There is a small bow on the back of the brim. In her right hand she holds a large gray muff made of fur. She looks down and her left hand reaches up to her left shoulder." "A woman wears a floor-length black dress with long sleeves and a high waist. The dress has white lace cuffs and a high, standing collar of white lace. The neck is trimmed with black fur which continues in two vertical lines down the skirt to the hem. Black, diamond-shaped decorations are interspersed between the two lines of fur. A black ribbon fastens under the bust with two black squares. She wears a black, fur-edged cape loosely wrapped around her shoulders. Two black tassels on a loop of black cord or beads hang from her right shoulder. The woman wears a necklace and earrings of black, diamond-shaped beads. Her bonnet is soft, black and trimmed with both black and white feathers. She wears a black glove on her right hand, while her left hand is bare. She holds a white handkerchief with both hands and looks down." 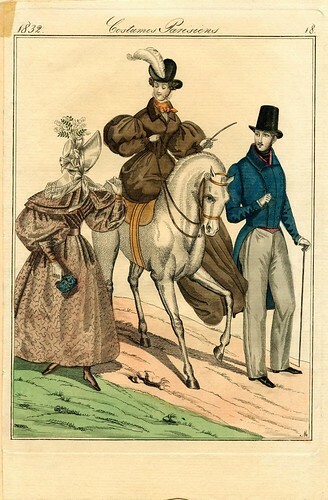 "Two women and a gentleman in Paris fashions from 1832. The woman on the left wears a light brown patterned dress with long, leg of mutton sleeves. The bodice is pleated and crossed over itself. She wears a brown ribbon belt and a wide collar covers her shoulders. There is a white lace and ruffle-edged collar over the brown collars. Her cuffs are copper colored, and she wears white gloves and brown walking boots. She wears a white bonnet decorated with white ribbons and bows, and white flowers with green leaves. 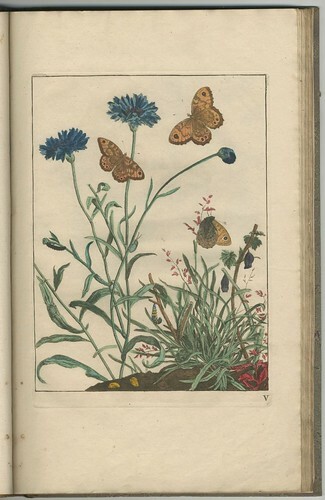 In her right hand is a bouquet of blue flowers. She looks toward to other two people so that her face is not visible. She is gesturing behind her with her left thumb. She stands on the grass next to the dirt roadway. The lady on horseback in the center wears a dark brown riding habit. Her sleeves are also leg of mutton style, and she has a narrow fold over velvet collar. Her white bodice shows through the opening at the front. The high collar of the bodice has a small ruffle at the neck and has an orange neckscarf is tied at the front in a small bow. Her riding habit buttons up the front with small black buttons. She wears a high brimmed black hat with a large white feather plume at the front. She carries a riding crop in her left hand and she holds the reins in her right hand. She rides side-saddle. The horse is white with a light tan saddle and tack, and a dark leather bridle. The man on the right wears a dark blue redingote with gray trousers and a red vest. He wears a black cravat, black shoes, and gray gloves. He wears a black top hat and carries a walking stick in his left hand. Both he and the woman are traveling on the dirt road and looking at the woman on the grass verge to the left." 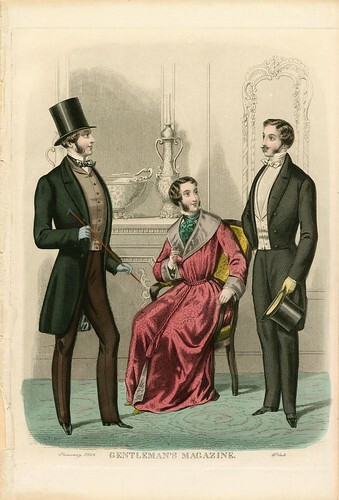 "Three men are depicted in a parlor. The man on the left wears a top hat and a daytime suit. He wears a green bow tie, a light brown vest, brown trousers, and a dark green frock coat. He wears light blue gloves and holds a cane in his hands. The man in the center sits in a gold upholstered arm chair. He wears a green cravat, a white shirt, and a maroon dressing gown. The lapels, cuffs, and lining are gray, and it is tied with a cord at the waist. The man on the right wears a dress suit. He wears a white shirt, cravat and vest, with black trousers and dress coat. He holds his top hat in his left hand. This gentleman has a small pointed mustache, and all three wear chin length sideburns." 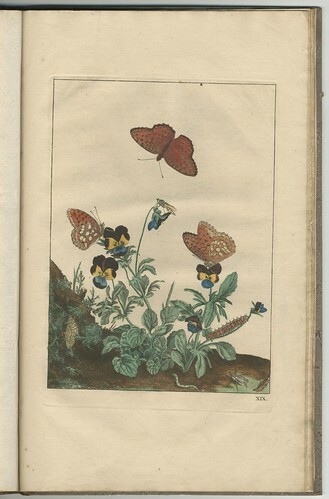 ¶Godey's Lady's Books: University of Rochester & University of Vermont & University of Virginia. 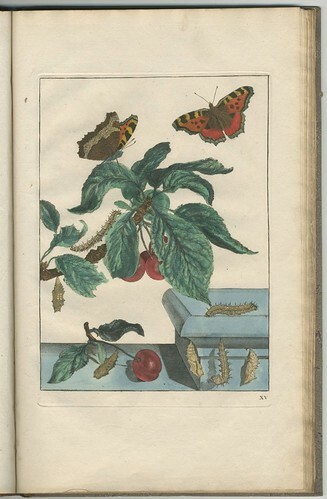 The first edition of 'Naauwkeurige Waarneemingen...' (~Accurate Observations...) by the Dutch amateur naturalist, Jacob L'Admiral Jr. (1700-1770) was published in 1740 and is hosted by the Tresoar website. 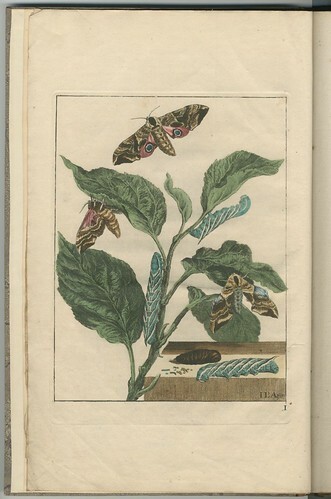 The engravings feature naturalistic scenes of butterfly and hawk moth metamorphosis with their associated plants. 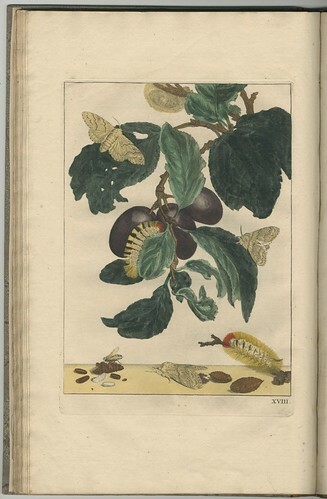 The author both engraved the twenty five illustrations and hand coloured the plates himself. 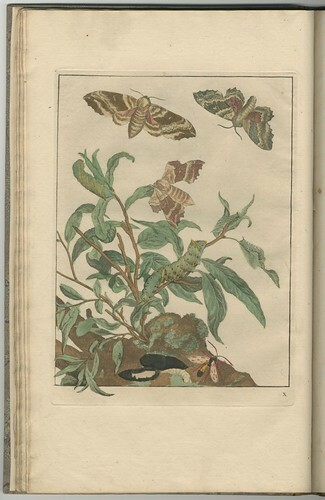 A second edition was edited and released in 1774 by Martin Houttuyn [see: The Wood Book] featuring a further eight previously unpublished plates by L'Admiral. 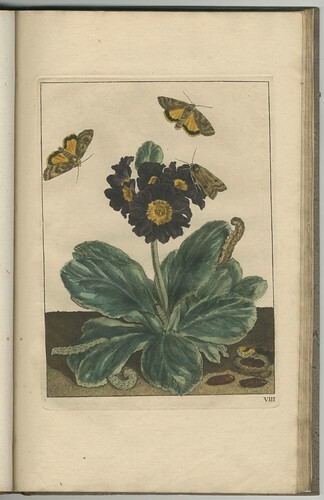 I believe that both British and Dutch insect species are illustrated. "It would be useless at the present day to say anything in praise of a work, which has been so long favourably known as 'The Aurelian'. 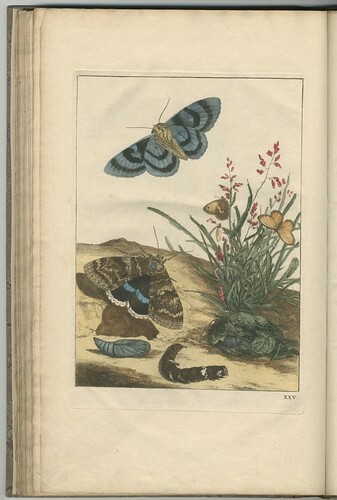 That Harris took the idea from L'Admiral's work is certainly true, and that one or two of his figures of very rare insects are copied therefrom is admitted by Harris himself, but the grace with which he delineated the difficult and varied positions of insects whilst on the wing, the elegant arrangement of many of his plates, and above all the correctness of his figures, are a sufficient answer to the charge of plagiarism which has been brought against him."